LFCHD employees received information, played games and ate pizza during the agency’s first-ever Committee Fair on Wednesday. The event was a chance for employees to learn more about the four primary employee committees (Safety, EEO/Diversity, Employee Association and Employee Wellness) and sign up to get involved with the groups. Each station brought its own information, games and prizes, with administration providing four overall gift card prizes. The winners of those were Bailey Preston, Karen Cecil, Cristina Hiten and Mindy Sekhon. The winners of the Safety Committee’s drawing were Debbie Davis (fire extinguisher), Carol Hisle (fire extinguisher), a first-aid kit (Donna Jones) and a flashlight (Skip Castleman). Additionally, Guadalupe Blankenship won a Fitbit Charge HR for participating in the Wellness Committee’s blood-pressure tests. Note: click on an image to see a larger picture. Human Resources arranged for the Kentucky Blood Center’s Bloodmobile to visit the Lexington-Fayette County Health Department on May 13, and numerous employees lined up to help save lives by giving blood. In fact, LFCHD registered 11 donors, resulting in nine donations in just a 90-minute timeframe. These donations will save the lives of 27 grateful Kentucky patients! This was LFCHD’s first Bloodmobile visit since the consolidation of services at 650 Newtown Pike, which resulted in a few new donors who used to work at 805 Newtown Circle. Donors were also entered in a random drawing for a chance to win a $25 Kroger gift card; the winners of the drawing were Jenny Preston and Theresa Lakin. Congratulations, Jenny and Theresa, and thank you to all donors who helped save the lives of those in our community! 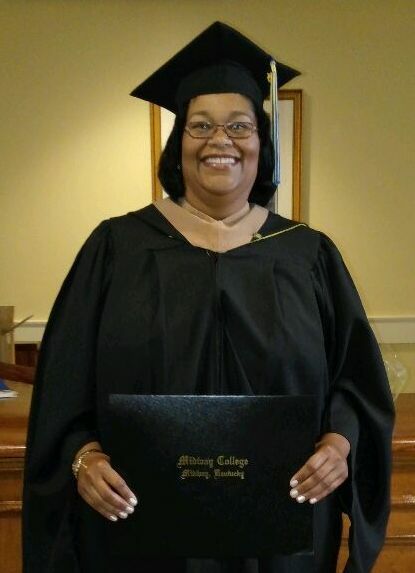 The Lexington-Fayette County Health Department congratulates Public Health Officer Roanya Rice, who recently received her Master’s in Business Administration from Midway College. Rice, who is also a registered nurse, received her Bachleor of Science in Nursing from Berea College. She has been with the health department for more than 13 years. Our Environmental Health team gave 425 rabies shots last Thursday as part of its annual low-cost clinic for the community. The event was held 6-9 p.m. at Douglass Park. State law requires that all dogs, cats and ferrets maintain a current rabies vaccination. The LFCHD Rabies Control Program received 768 animal bite reports last year, with LFCHD staff making sure each animal was up to date on all rabies vaccination shots. The clinic also provided pet owners with the opportunity to purchase an animal license, which costs $8 if the animal has been spayed or neutered. A license costs $40 if the animal has not been fixed or the owner has no proof of alteration. Lexington-Fayette Animal Care and Control, the Lexington Humane Society and the Lexington-Fayette County Division of Parks and Recreation Department also sponsored the clinic. With one final flourish, the new LFCHD signage update was completed Friday afternoon. As part of the clinic’s move to 650 Newtown Pike, we met with the managers and staff to determine the best options for signs and information to help the public reach the areas most used by drop-in clients, patients and visitors. Guests will now be greeted with the panel boxes on the front of the building, information and hours on the front door, a vinyl Public Health banner in the front lobby and directional signs below the front desk and off the elevator on the second floor. Take a moment to join us and help celebrate National Nurses Week 2015. Annually, National Nurses Week begins on May 6, marked as Registered Nurse (RN) Recognition Day, and ends on May 12, the birthday of Florence Nightingale, the founder of nursing as a modern profession. The American Nurses Association encourages all RNs to participate in recognition activities and to educate the public about the nursing profession and its role in their lives.